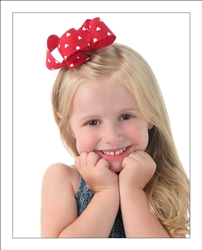 Sweet Princess Bowtique's big girl hair bows are the perfect size for your sweet big girl! Our big girl hair bows are made with 1 1/2" ribbon, measure 4" wide and are attached to lined alligator clips or french barrettes. As always, each and every end has been professionally heat sealed to prevent fraying!